A true Parisian by definition has a home in the city. And to experience the city of lights like a true Parisian, a great way to get started is to rent your own temporary home. Apartment renting is a popular alternative to hotels. Renting has plenty of benefits, especially for larger groups. Instead of being crammed in multiple hotel rooms, your group can rent an ideally sized apartment. Apartments are also cozier, making it easy to relax when you return from your daily adventures. And if your apartment has a well-stocked kitchen, hit the local market and cook up your own meals from fresh ingredients. You’ll save a ton when you skip the restaurant and indulge in local cuisine cooked in your very own temporary home. Aside from the commercial rental market, one ingenious route to living like a local is apartment swapping. Stacey Wolf shares her NYC-to-Paris tale at GoNOMAD. 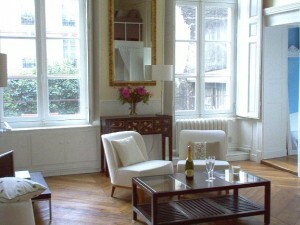 And if you have a thin wallet and an open mind, enjoy the hospitality of Parisians in their own homes. Pour Vous Paris connects foreign travelers to locals who will, for a modest fee, host and spend time with their guests. For some useful renting tips, visit GoNOMAD’s mini guide to vacation rentals in Europe. Read more about France on GoNOMAD.